Week 15’s Laws of the Game Quiz is here for you. But first I’d like to mention a discussion I had about the restart of play in Week 14’s question 5. The Dutch FA (KNVB) says this is an indirect free kick. 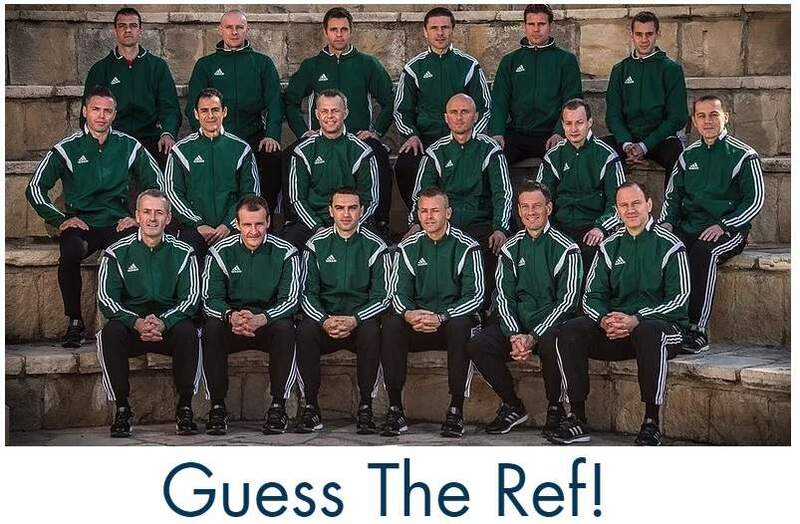 I used one of their questions for professional referees. The LOTG do actually not mention this, only throwing objects. The IFAB will publish something about this in the 2017-2018 Laws Of The Game. 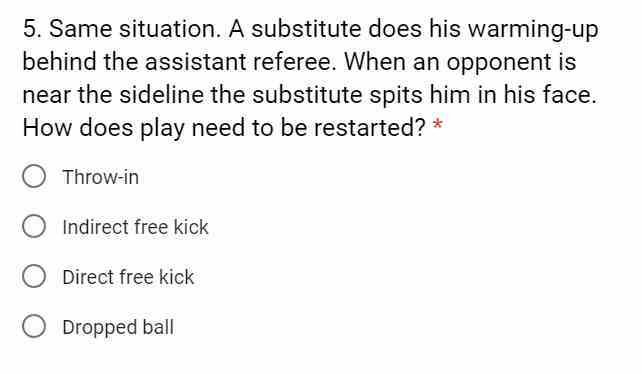 The decision you need to make will be: “Dismiss the substitute and award a direct free kick to the opposing team on the boundary line (or give a penalty kick if it was within the substitute’s penalty area)”. That’s good to know for you all. I’ll keep you posted about new developments. For now: good luck with this new quiz. In the week 15 LOTG quiz, you discussed question 5 from Week 14’s LOTG quiz. Specifically, where the restart should be for a SUBSTITUTE that is off the field who spits at an opponent that is on the field. Your clarification in week 15 is that the substitute should be dismissed and the restart should be a DFK; however, since this is an act committed by a SUBSTITUTE and not a PLAYER, I believe the restart should be an IFK. 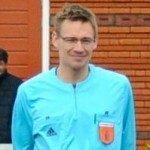 A DFK is the result of a foul committed by a PLAYER. A SUBSTITUTE cannot commit a foul, only a misconduct. I specifically reference page 89 of IFAB 2016/17 LOTG and the last item on page 133 of the FIFA 2015/16 LOTG. What if #4 were like #3 and the referee didn’t notice until the shinguardless player scored in the 10th minute? I suppose you’d just have to order the scorer to leave the field prior to kick-off. Once you notice it, you should take action as referee. If you notice it during the check before the game, you order him to adjust his equipment and use shinguards.